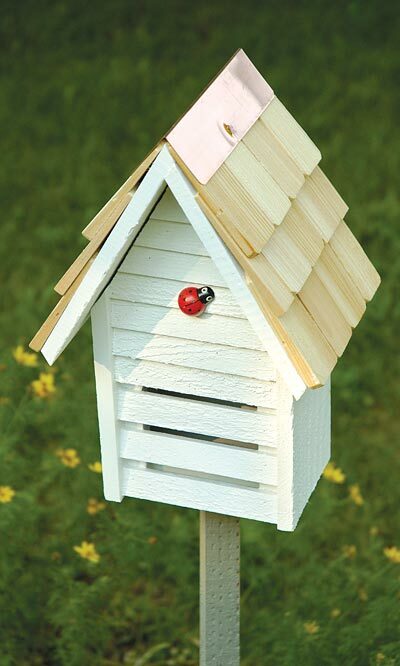 Let this little ladybug invite others into your garden using the Heartwood Lady Bug House with Mounting Pole. This charming home features a weathered exterior and shingled roof, with a small copper accent capping the roof. Ladybugs are known to dine on aphids, mealy bugs, and scale insects, providing a pesticide-free way of controlling harmful insects. Horizontal slats supply large entry and exit ways, and the roof lifts off for cleaning and observation. The home may be mounted using the included mounting pole, or placed on a flat surface. A hand-painted ladybug accent gives this house character, helping you maintain a great garden season after season!